• April 6th 2019, Crossing the Firth presented at the HearSay International Audio Arts Festival 2019 in Kilfinane Ireland. • March 30th 2019, More Than Gold, written for the Capella Caeciliana choir, premiered at St. Malachy’s Church, Alfred Street. Belfast. • March 20th 2019, I presented a paper on my work at the Contemporary Approaches to Music Composition – Practice as Research symposium at Dublin City University. • March 2nd 2019, Engines of Babel, commissioned by the Crash Ensemble, premiered at the New Music Dublin Festival 2019. • February 27th 2019, Five Scenes from a Retro Viewer premiered by the Ficino Ensemble in Dublin. • February 17th 2019, the Hard Rain Soloist Ensemble perform Perelandrian Drift for the second time at the SARC building in Belfast. • February 6th 2019, Crossing the Firth premiered at the season launch concert of the Irish Composer’s Collective. • January 10th 2019, Enturfment workshopped by members of the Ligeti Quartet and the Gildas Quartet as part of the BFE/RMA Conference in Sheffield, where I will also be presented a paper. • January 8th 2019, the Ulster Orchestra performed the fourth movement of The Pearl for broadcast on Radio 3’s Hear and Now programme. Broadcast date April 2019. • December 1st 2018, A Slave in the Land of Liberty for mixed choir and soloists performed by the C4 Composers-Conductors Choir in Manhattan, New York. • November 23rd 2019, PANIC Music Ensemble (of which I am a founding member) premiered two of my pieces The Shy Man for baritone and piano (2015) and Threads and Ribbons for baritone and guitar (2018). 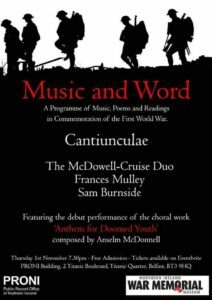 • Nov 1st 2018, Anthem For Doomed Youth performed by the Belfast-based Cantiunculae choir (who commissioned the work) as the centrepiece of a concert commemorating the centenary of World War I, conducted by the composer. 23rd May 2018 Selected as a finalist for the 3rd International Sergei Slonimsky Composition Competition, Moscow, Russia. My work ‘Sir, we wish to see Jesus’ to be performed by the GAMEnsemble. Concert programme. 22nd May 2018 Horn piece performed by Andrew Budden and filmed at St Michael’s, Manchester, as part of the Psappha Composing For Horn Scheme 2018. 14th March 2018 ‘Dancing While Others Sleep’ premiered by Ficino Ensemble at the Ulster Museum as part of Moving On Music ‘Night Music Series’. 21 June 2017 ‘Two Baptisms in Solway Firth’ premiered by The Assembly Project at St. Magnus Cathedral as part of the St Magnus International Festival, Orkney, Scotland. 19th June 2017 ‘Maeshowe Scrawls’ work-shopped at the St Magnus International Festival, Orkney, Scotland. 16th June 2017 ‘Morgan’s Waltz’ work-shopped with The Assembly Project at the St Magnus International Festival, Orkney, Scotland. 26 May 2017 ‘Sir, we wish to see Jesus‘ for flute, cello and piano, written for and premiered by the Marsyas Trio. Vale of Glamorgan Festival, Cardiff University School of Music. Feb 2018 ‘Hinneni’ choral piece performed by St Salvator’s Chapel Choir at St Salvator’s Chapel, St Andrews, Scotland, as part of the Service of Readings and Music. April 2017 ‘Hinneni’ choral piece performed by St Salvator’s Chapel Choir at St Salvator’s Chapel, St Andrews, Scotland. August 2018 Japanese premier of two of my guitar works performed by Rosetta Contemporary Ensemble. April 2017 BBC Radio Ulster, ‘Classical Connections’ with John Toal. Guitar performance recorded at Blackstaff Studios, Belfast and broadcast on 18th June 2017. 9th March 2017 Harty Room, Queen’s University, Belfast, premiere of my latest classical guitar compositions. March 2017 BBC National Orchestra of Wales premiered the orchestral version of ‘The Pearl: Movement IV’ in Cardiff. 21st Feb. 2017 Hard Rain Soloist Ensemble performed ‘The Great White Throne’ in the Ulster Museum.